Guitarist Jim Hall gave a concert with Steve LaSpina and Joey Baron at the Library of Congress on March 20, 2009. It was his first public performance since recovering from back surgery the year before. Hall graciously agreed to sit and talk a while just before sound check. The studio lighting was a bit harsh that day but the insights flowed as his story unfolded. David Amram plays his variations on “Amazing Grace” in the Mary Pickford Theater at the Library of Congress, April 25, 2011. David Amram talks about the 1950s jazz scene in Washington D.C., including the story of Charlie Parker visiting his apartment, hanging out in his kitchen and “scarfing” down a crazy omelet. The telling of this story took place following the screening of Larry Kraman’s new documentary film “David Amram: The First 80 Years” at the Library of Congress, April 25, 2011. Earlier today I interviewed Honey Ear Trio on my radio show. Tonight I caught a bit of their sound check at Bossa here in Washington DC. The trio includes Erik Lawrence, saxophone; Rene Hart, bass and electronics; and Allison Miller, drums. A bit of my Before & After interview with Jimmy Heath at the Mid-Atlantic Jazz Festival, Rockville, MD Feb. 18, 2011. Jimmy talks about Ben Webster, Johnny Hodges, Johnny Griffin, Sarah Vaughan, Billy Eckstine, the importance of interpreting the lyric and the “three ears” through which we listen to music. Complete article appears in the May 2011 issue of JazzTimes. 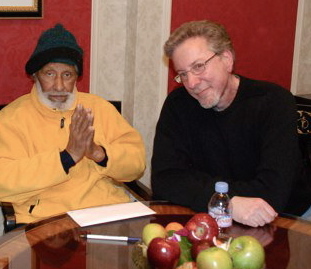 I met with Sonny Rollins on Feb. 28, 2011 to conduct this oral history interview for the Smithsonian. I purposely chose to avoid the questions that Sonny been asked so many times before, especially the stories that have been documented in various biographies, jazz history books and articles. Here is pt. 1 of the interview, which now appears on Sonny’s web page. Thank you Sonny Rollins, Ken Kimery and Bret Primack. Tonight I showed Louise Ernst’s film “El Trombon de Bomba” at the Library of Congress Jazz Film Series. The 2002 documentary–a multi-layered portrait of Puerto Rican trombonist and composer William Cepeda– was shot in New York, Paris and his hometown of Loiza, PR. For the free screening, Cepeda came down from Brooklyn to introduce the film and take questions after. Let’s just say it was not your typical introduction. He spoke briefly, then played his conch shell and engaged the audience in a bit of call & response. Thanks, William!